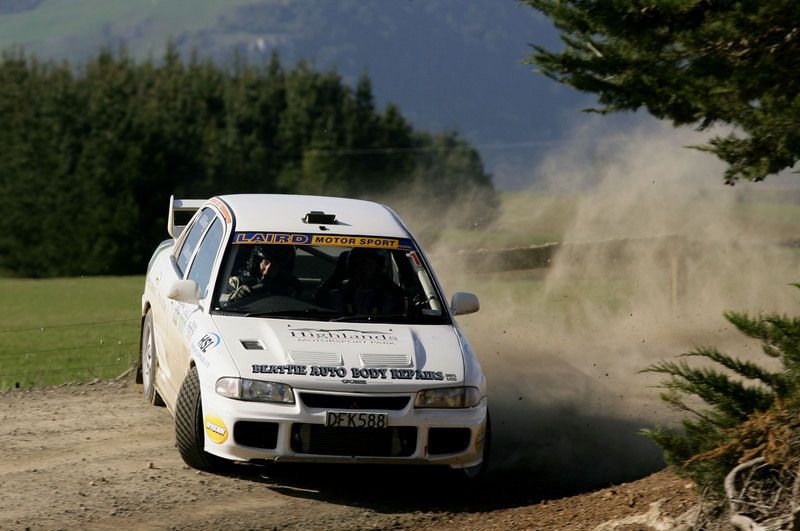 Defending champion, Andrew Graves of Gore in a Mitsubishi Lancer EVO 3, took his fourth Catlins Coast Rally victory when he won the 2018 event on Saturday. Graves and co-driver Jared Leebody built a buffer of 43 seconds over current NZ Rally Champion Andrew Hawkeswood in the first two stages and maintained their advantage throughout the day to finish with a 53 second margin over Andrew Hawkeswood/Jeff Cress of Auckland in their Mazda 2 AP4. Carter Strang and Stewart Robbie of Wallacetown in their EVO 6 were third. Graves won four of the six stages and Hawkeswood the other two. “I had a couple of goes at crashing” said Hawkeswood, admitting he lost time in both Stages 1&4. “It was hard without notes. This is the first rally without them since last time I was here but no excuses, Andrew (Graves) did really well. He was pretty incredible, the better man won today. I might need to become a local,” he joked. Strang finished third ahead of a trio of Cantabrians, Jeff Judd (Impreza), David Quantock (EVO 8) and Garet Thomas (Impreza) with 2016 winner Vaughan Edie of Invercargill seventh in an EVO 8. John Giltrap of Lincoln was next with the first of the 2-wheel-drive cars, that of Derek Ayson of Gore, ninth ahead of Marcus Van Klink from Christchurch. Victory secured Graves/Leebody the Darryl Robinson Memorial Trophy while the Kerry O’Donohue Memorial Trophy for the first South Otago crew home went to Dean McCrostie/Kim Craig of Milton and the Glen Shirlaw Memorial Trophy for the first Otago Sports Car Club driver home to Richie Chadwick. Major casualties were Balclutha driver Barry Mills who went off the road in SS1 in his Hillman Avenger while fellow Balclutha driver, three-time winner Dean Bond, met a similar fate in SS3 in his EVO 6.5. Last year’s NZ Rally Championship runner-up, Matt Summerfield of Christchurch, was fast all day in his Subaru Impreza WRX but lost a lot of time in Stage 2 due to overheating. Aucklanders Hawkeswood/Cress, Mark Parsons/Mal Clark of Drury and Andy Martin/Matt Hayward of Tauranga were the top three in the Stadium Finance Southern Challenge for drivers who crossed the water to compete. With the top three finishers ineligible for class prizes, the Class D Valley Coachlines 4-wheel-drive honours went to Jeff Judd in fourth in his Impreza while the Ritchies Class E for Pre 96 4-wheel-drive cars went to Mark Parsons in another Impreza in thirteenth. Derek Ayson won the class he contested and sponsored, the Derek Ayson PGG Wrightson Real Estate Class G for 1701cc & over classics. Van Klink took the Window Tint South Class C for 2-wheel-drive cars of 1601cc & over and fourteenth place earned Richie Chadwick the Alexandra Auto Electrical Class B victory. Winton driver Brendon Mitchell took the Flashclad Class F for 0-1700cc Classics in twenty-sixth place and Jonathan Taylor of Waikuku secured the Balclutha Auto Electrics Class A for 2-wheel-drive cars of 0-1300cc. Chris Hogan of Queenstown was the winner of the Laird Motorsport & Models Novice Driver Award while Greer Edie, co-driving with father Vaughan, won the Novice Co-driver award. A special award was made to Brayden King and Jordyn Whyte of Invercargill who completed the event 20 years after their fathers competed at Catlins. The rally was Round 6 of the MRF Tyres Mainland Rally Championship and part of the Eastern Southland Car Club Rally Championship. Major support for the 2018 Catlins Coast Rally came from Rosebank Lodge Balclutha, Southroads, Owaka Motors, Yuasa Batteries and Stadium Finance while special thanks are due to Rayonier NZ Ltd and the Clutha District Council for their assistance with the event.